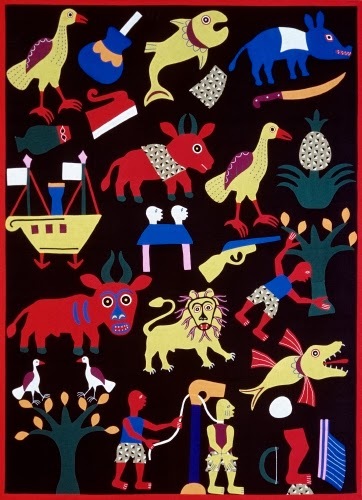 Many years ago I was fortunate enought to go to an exhibit of Kuna Mola textile art in Chicago. It actually blew my mind, because it is very complex. 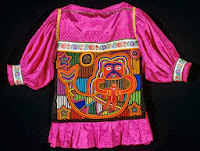 And yet, it is the common textile art form of the Kuna, and has become world-famous. Textile arts have always been a special interest of mine, and I love finding out as much as I can about them. Well, this was my “epiphany of the week” for my co-workers when I added it to our collection. It’s so beautiful I had to share it with you! The Kuna culture was primarily in Colombia until the Spanish invaded in the early 1600s. Fleeing the Spanish, they migrated to Panama, eventually to the San Blas region, particularly on the small islands off the coast. 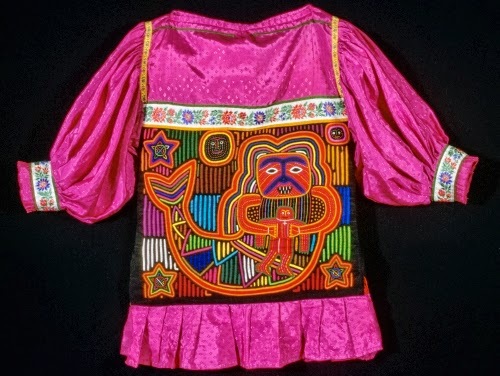 Mola cloth was a traditional part of Kuna culture, and the Kuna staged a rebellion in 1925 with the newly independent Panamanian government tried to enfore “national culture” on them and discourage the production of Mola. By 1945 the Kuna had established a semi-autonomous reservation in the San Blas region. Mola textiles contiue to be a source of national identity for the Kuna. Mola cloth is used in a variety of forms, including dresses, shirts, pillow covers, and carrying bags. The technique is incredibly complex. Normally, as many as two to seven different layers of differently-colored cotton cloth are basted together. Each design (meaning, each individual line, is cut from one layer of color, folded under, and sewn to the lower layers. This painstaking work is usually done with hand stitching, though in the late 1900s, artists used sewing machines to apply the finished textile to a background support, usually plain weave cotton. This particular piece uses some printed textiles as layers. Chain, running and satin stitches are the kind we see in embroidery. Mola tends to be a comination of embroidery and appliqué. Traditional designs tended to be geometric, while modern designs reflect not only native cultural influences but also contemporary society. This piece seems more traditional. Fon People, Benin, Appliqué cloth, 1970s Private Collection, Davis Art Images (10666) While the technique is different in pure appliqué, where cut out pieces of cloth are sewn onto a ground, the forms remind me very much of what is seen in Mola pieces. Activity: Show this image to students and see if they can identify how many layers of colored / printed cloth comprise this textile.